My son. He S.U.C.K.S. at sleeping. He is the worst sleeper on planet Earth, I’m fully convinced he isn’t human and being able to function on little to no sleep is his super human strength. His whole life, even from inside the womb he has never needed rest. Let me be VERY clear- this is NOT a behavior issue, this is just life with Jack. We have literally tried every sleep training method known to man and then some of our own techniques. I was a firm believer in cry-it-out and that’s what we tried first. We did it with our oldest and she’s the best sleeper I know. 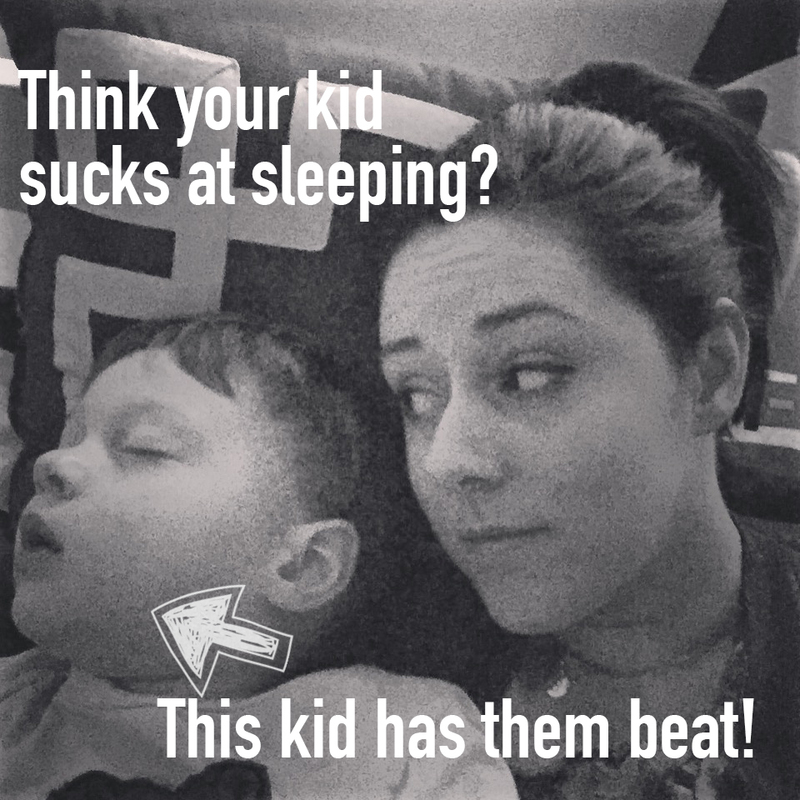 In fact, every time someone would complain about their kids not sleeping I was the first to suggest it. – From newborn to 14 months old Jack took 2- 15 minute naps a day. To get those naps I’d have to nurse and rock him for at least 45 minutes. He would sleep from 6:30 am-6:30 pm (would take me at least 45 minutes to get him to fall asleep at night) and wake up at least 4 times to nurse at night. When he woke up at night, we’d have to start all over. – I weaned Jack around 15 months old, he also started walking. He dropped down to one nap a day, usually around 1 hour and it would take me 30-45 minutes of rocking to get him to sleep. He would sleep from 7:30 pm – 6:30 am (it would still take me at least 45 minutes to get him to sleep) and wake up screaming bloody murder 4 times a night. It would take us around 30 minutes to an hour to get him back asleep. – At 2 Jack finally started napping easily. We converted him to a toddler bed and lay down with him until he fell asleep. It took about 30 minutes for nap and over an hour for bedtime. He would nap for 1.5 – 2 hours (FINALLY!!!) and sleep from 8:00 pm – 6:00 am. It was still taking us at least 45 minutes to get him to sleep at night. – At 2.5 years Jack takes about an hour nap easily but won’t go to sleep at night until almost 10 pm. His bedtime is at 8pm but he has a very hard time falling asleep forcing us to be in with him for the 2 hours it takes for him to settle down. We have tried cutting out nap only for him to be so over tired that he STILL can not fall asleep at even with an earlier 6-7 pm bedtime. He usually wakes around 7:00 am. Sprinkle in a WHOLE lot of days and nights of no sleep and you can somewhat picture our situation. And when I say a few hours of sleep…I’m not talking about just us, our CHILD is the one only getting a few hours. But somehow he’s perfectly fine on those no sleep days. I’m not sure how I can fully voice my frustration with these sleep issues in writing. This has been the single most stressful part of being a parent for me. I can’t get my child to fall asleep, and he can’t get himself to fall asleep alone. It’s stressful for our entire house. About 6 months ago (just after he turned 2) our pediatrician OK’ed melatonin. We gave him an extremely small dose- I will not go into how much because this will vary depending on your child’s age, weight and the situation. I didn’t think it would work but he was asleep within 20 minutes the first time we gave it to him. It was our miracle drug, our lives would finally be different and Jack would FINALLY sleep!! Except he didn’t. He could fall asleep easily but would wake up with the worst night terrors I have ever witnessed. We kept adjusting the dose down until he was being given only a dusting on his tongue. He would still fall asleep with ease, but the night terrors would not let up. So we took him off of it and have been dealing with 2 hours of getting Jack to fall asleep every night. I have completely given up hope for a good night’s sleep. Jack obviously doesn’t need it- he’s a very happy and healthy 2 year old. My husband and I on the other hand? We have no time to do anything. We are in the middle of a major move and there were 3 days last week where we couldn’t even get 30 minutes to sit down and talk because one of us has to put Jack to bed from 8 – 10 pm. Several weeks ago a sponsored ad came across my FaceBook feed. It was about a book “The Rabbit Who Wants to Fall Asleep“. I normally don’t click on ads but I was intrigued because…well if you need to know you should probably go back up and reread this entire post. I saw several comments from Moms saying the book helped their toddlers and preschools fall asleep. Even babies! I had to know more so I private messaged “The Rabbit” and got a respond right back from Carl-Johan, author of the book. He sent me a copy to review and I can’t wait to share the results with you! We’ve been using the book for about a week but going on a house hunting trip threw a wrench into things. I have seen some positive changes in the way Jack falls asleep and have actually learned a lot just by reading the book. « The Barton’s are on the move! Omg this is our life. My son DOES NOT SLEEP! Like Jack after one we finally got to experience what a full night sleep was. Sometimes, in his infancy, he would sleep three hours then nurse,but sometimes he wouldn't finish nursing for an hour. But at that three hour mark he was up again. I feel like bc he nursed until 15mos and nursed for comfort (no pacie) he never learned to self soothe…I don't know. I could give hundreds of reasons I think he doesn't want to or can't sleep but I really have no clue. He's a normal happy kid, he's just not down with giving up on the day. I just saw this book in an ad online today, bc like you anything that suggests help for toddlers to sleep, I am ALL over it.